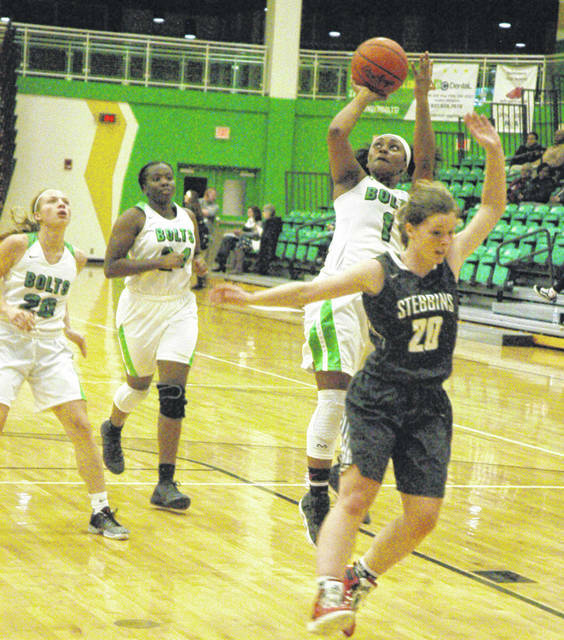 Amair Bradford muscles past Stebbins defender Katelynn Johnson. Camryn Nadir cuts inside past Daleasha Moore. Kaitlyn McCrary cuts under Kristine George to score. Makayla Cooper scores a short jump shot inside the paint during the second half against Stebbins. 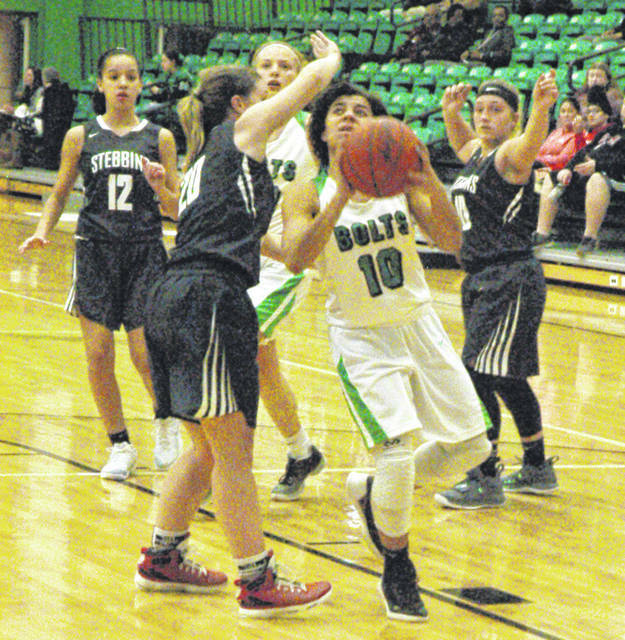 CLAYTON – After suffering a 10 point loss to National West rival Lebanon on Nov. 28 the Northmont girls basketball team bounced back into the win column Monday with 63-36 victory over American South opponent Stebbins. The Lady Bolts established control early by going on an 11-0 run to take a 15-2 first quarter lead. Junior guard Kaitlyn McCrary accounted for nine of Northmont’s 17 first quarter points and scored 12 in the first half including a pair of 3-pointers. She made two steals in the first quarter to score easy layups. She ended the game with a team leading 18 points. Stebbins only managed to score three baskets in the second quarter, all from 3-point range, to trail 31-15 at halftime. 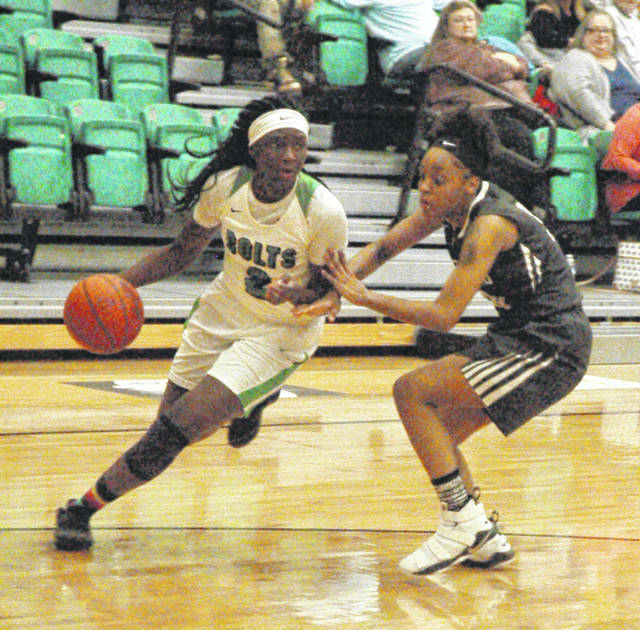 McCrary opened the second half scoring for Northmont and Makayla Cooper scored on a put-back, buried a 3-pointer and sank a pair of free throws to boost the lead to 40-17. Camryn Nadir followed with a steal and a score and McCrary scored inside again to make it 44-17. From there Northmont cruised to an easy 27 point victory to improve to 2-1 overall. Stebbins fell to 0-2. Sophomore 6-foot center Jacquel Bronaugh scored nine of her 14 points in the second half. Paired with senior 5-foot, 10-inch center Shalaya Heath the Lady Bolts dominated play inside the paint. Eight of Northmont’s 11 players scored to contribute to the victory. Kincer was also happy with how many steals her team was able to come up with during the victory. “Kaitlyn McCrary, Camryn Nadir and Makayla Cooper are so fast. I just keep telling them that we have to have our offense boosted by our defense and get in the passing lanes and to just continue to use their speed to make that happen,” Kincer added. Stebbins: Shelbie Morgan 4-0-10, Kennedie Lingg 1-0-3, Sophia Coaston 1-1-3, Bailey Roche 2-0-6, Katelynn Johnson 2-0-4, Korina Murphy 1-3-6, Olivia Newlin 0-1-1, Haylee Gunter 1-0-3. Totals: 12-5-36. 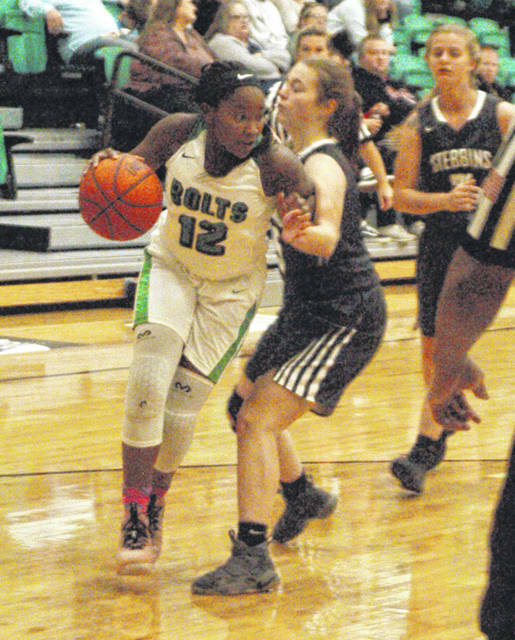 Northmont: Makayla Cooper 4-2-11, Camryn Nadir 4-0-8, Kaitlyn McCrary 8-0-18, Amair Bradford 1-0-2, Dasia Turner 1-0-2, Shalaya Heath 2-2-6, Ashley Besingi 1-0-2, Jacquel Bronaugh 6-2-14. Totals: 27-6-63. 3-point goals: Stebbins 6 (Morgan 2, Johnson 2, Murphy, Gunter); Northmont 3 (McCrary 2, Cooper). Records: Stebbins 0-2, Northmont 2-1.